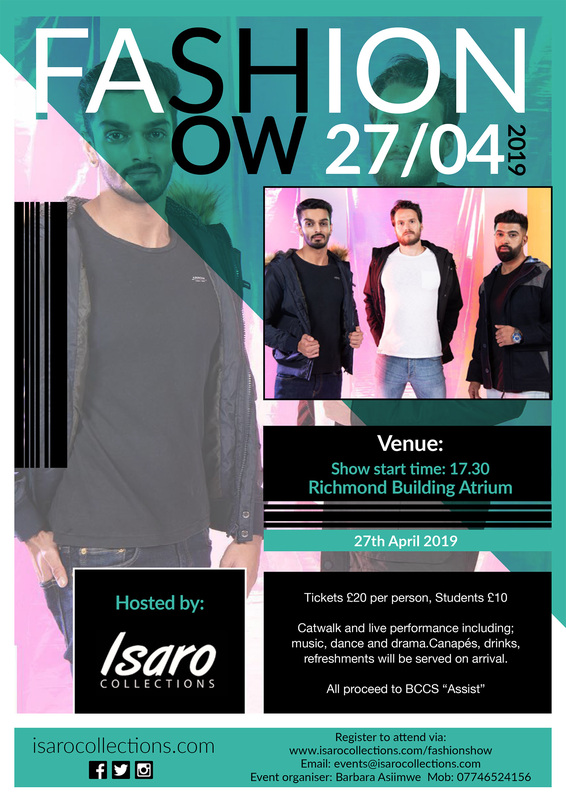 ISARO FASHION SHOW IS BACK! Following the success of the 2018 event, the Isaro show is returning to Bradford in 2019, and even bigger than before. The show provides a platform for emerging designers in Bradford and across the district, and has a theme of ‘Fusion Fashion’ bringing communities together to celebrate cultures and diversity through style and design. Emerging, independent and established designers, entrepreneurs will come together to showcase their creative innovative work in fashion and design. Broadway fashion retailers and local and regional manufacturing textile companies, education and other sector businesses will team up as sponsors and partners of the show to help celebrate and create awareness of opportunities and challenges our local fashion designers and entrepreneurs face. All funds raised on the day will go towards BCCS “Assist”, which supports people on the margins of society, and so we hope we can rely on your support. Tables of 6 can be booked for £100 by emailing events@isarocollections.com or calling 07746524156 (single places are £20). The event is scheduled to run between 19:00 and 22:00, with the doors open from 17:30 to give an opportunity for guests to network, to meet the designers, and browse their latest collections.